The head of the Anglicans in the United States has accused other churches, including the Church of England, of double standards over sexuality. The Presiding Bishop of the Episcopal Church, Katherine Jefferts Schori, told the BBC her church is paying the price for its honesty over sexuality. The threat of schism in the Anglican Communion was prompted by the appointment of a gay bishop. 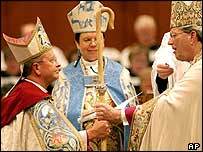 The US church elected an openly gay man Gene Robinson as a bishop in 2003. Presiding Bishop Jefferts Schori defended her ministry. 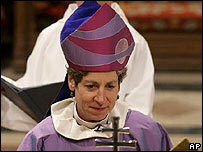 "He is certainly not alone in being a gay bishop, he's certainly not alone in being a gay partnered bishop," she said. "He is alone in being the only gay partnered bishop who's open about that status." She said other Anglican churches also have gay bishops in committed partnerships and should be open about it. "There's certainly a double standard," she told BBC Radio 4's PM programme . The US church also faces criticism over its stance on services of blessing for gay couples. The church has stated it will not officially authorise such services, but Presiding Bishop Jefferts Schori admits they do take place. "Those services are happening in various places, including in the Church of England, where my understanding is that there are far more of them happening than there are in the Episcopal Church," she said. Presiding Bishop Jefferts Schori refused to criticise US parishes that carry out services of blessing for gay couples, saying that it was a decision for each individual church. 2008 is a critical year for the unity of the Anglican Communion. In July, Anglican bishops from around the world are due to attend the Lambeth Conference, convened by the Archbishop of Canterbury once a decade. Some African churches are threatening to boycott the conference - particularly if US Bishop Robinson receives an invitation. But Presiding Bishop Jefferts Schori says she thinks he might yet be invited. "We're still hoping that that might be the case," she said.